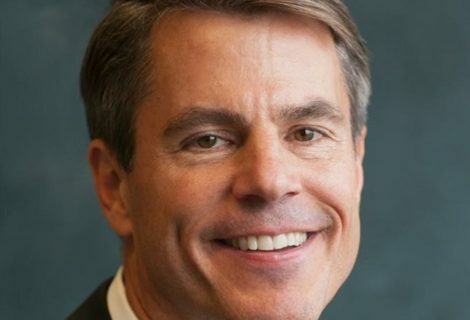 Participants stand to lose their retirement dreams due to loan defaults, but plan sponsors face equally serious risk due to increasing liability issues. 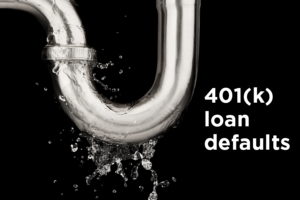 Many facets of loan administration fall under strict ERISA fiduciary standard guidelines, and the Department of Labor considers 401(k) loans to be plan assets, requiring oversight by plan sponsors who must take steps to help ensure positive outcomes for participants. $2.5 trillion in leakage. That’s not a trickle; it’s a flood. Because most defaults aren’t reported separately on Federal Tax Form 5500, it wasn’t clear until recently how severely loan defaults are tapping America’s retirement system. Now that loan defaults are being scrutinized, plan sponsors are under pressure to reduce the massive amount of leakage these defaults cause. The staggering $2.5 trillion figure predicted by Deloitte translates to about $300,000 in lost retirement savings per participant. Most participants who default on their retirement plan loan go on to eventually cash out their account entirely. Taxes and penalties compound a bad situation, and as a result, people’s retirement savings are going down the drain. That’s why it’s crucial to solve this loan default problem. Loans are a popular plan feature that can help increase plan participation and contribution levels, so they shouldn’t be restricted. They’re utilized by around 20% of participants at any given time, about 10% of whom default.3 That 10% adds up to $2.5 trillion in loss. 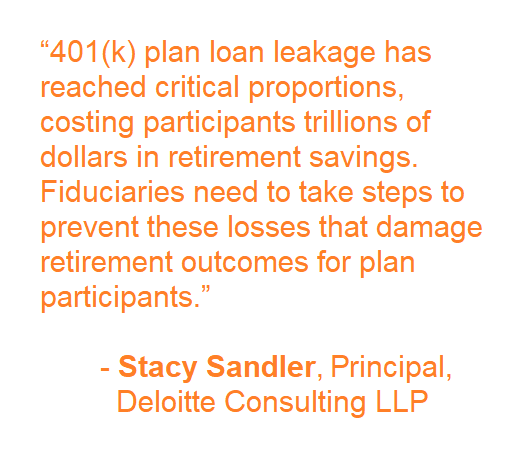 With two out of three plan participants reporting financial stress, loan defaults are not going to slow down on their own.4 A Boston College Center for Retirement Research study says leakage is set to reduce the wealth in US retirement accounts by 25% of current levels, once you compound the lost annual savings over 30 years.5 This leakage is more than a setback; it’s a national crisis that threatens to destabilize our entire retirement system. A simple change can stop the flood: Loan Insurance. Deloitte’s findings are worrying, but the study offers hope in its recommendations for how plan sponsors can turn back the tide. 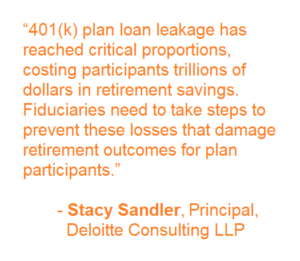 Altering plan design, providing loan education and instituting payroll automation are all helpful, but the simplest change a plan can make is the most impactful: offering participants retirement plan loan insurance. 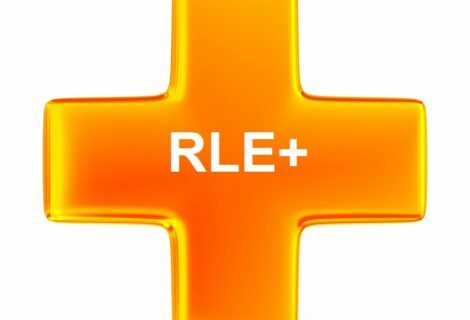 RLE is easy to integrate and doesn’t require any big changes to the plan. $2.5 trillion is a devastating amount of leakage. RLE can help stop the flood. Read more about this new study by the industry-leading consulting firm Deloitte by clicking here. 2 John Beshears, James Choi, David Laibson, and Brigitte Madrian, “Potential vs. Realized Savings Under Automatic Enrollment,” TIAA Institute Trends and Issues, July 2018. 3 Timothy Lu, Olivia Mitchell, Stephen Utkus, and Jean Young, “Borrowing from the Future: 401(k) Plan Loans and Loan Defaults,” Pension Research Council Working Paper, Wharton School, University of Pennsylvania, February 2014. 4 OneAmerica poll, September 11, 2018. 5 Anne Tergesen, “401(k) or ATM? Automated retirement savings prove easy to pluck prematurely,” Wall Street Journal, August 10, 2018.